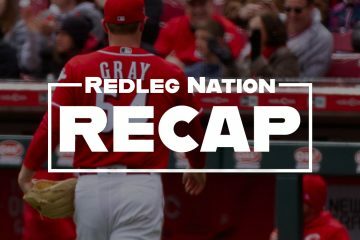 The Short Version: After a two and a half hour rain delay, the Redlegs — led by Phillip Ervin — brought out the bats and beat the Padres to even the series. –Outstanding game for Phillip Ervin, who went 3 for 3 with two home runs, a walk, four runs scored, and four runs batted in. One of those RBIs came on a squeeze bunt. Oh yeah, and for good measure, Ervin also had a nice catch in the outfield. –Jose Peraza had two hits, including a double. He also drove in three. Scott Schebler only had one hit (plus a walk), but it was a big one: a grand slam home run. –Michael Lorenzen allowed one hit over three scoreless innings of relief. He also singled and scored a run. –Joey Votto singled and walked. Eugenio Suarez singled, walked, and scored a run. Tucker Barnhart, singled, walked, and scored two runs. Mason Williams singled and scored two runs. –Jackson Stephens pitched a perfect ninth. –Anthony DeSclafani’s up-and-down season continues. Disco pitched four innings, allowing four runs on eight hits. He was pulled after throwing 64 pitches. –Sal Romano allowed two runs on two hits in the eighth inning. –Long night — a two hour, 37 minute rain delay before first pitch — but it was worth it. Even now, it’s still fun to watch the Redlegs break out the bats. –The Reds struck out fifteen times tonight, in just eight turns at bat. And they won big. Very nice. –The Reds set a franchise record for grand slams in a season, with 10. Baseball is such a funny game. This team is lousy, but Cincinnati has had so many great teams over the years. Yet 2018 is the year they hit more grand slams than ever before? I love it. –Jose Peraza is fourth in the National League in hits. Think about that one for a moment. –Ervin is hitting .279/.349/.448 on the season. If nothing else, he’s put himself in the mix to make this club out of spring training next year. –The Reds had Friday Night Fireworks before the game tonight, because of the rain. I feel like it is important to note this for the historical record. 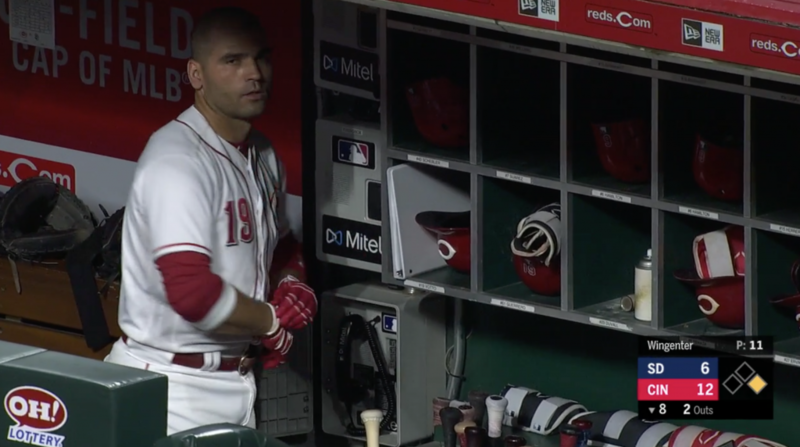 –For some reason, I enjoyed the fact that Votto had to move his three ring binder to make room for his helmet. –Disco gave up two runs in the first, and it was looking like another typical night for the home team. But in the bottom of the second, the Reds struck back. Suarez led off the inning with a walk. After Williams grounded into a fielder’s choice, Barnhart and Ervin walked to load the bases, and Williams scored on a passed ball to make the score 2-1, San Diego. After Schebler walked to load the bases again, the Padres went to their bullpen, but Peraza promptly doubled in all three runs. Reds 4, Padres 2, after two complete. –San Diego tied the game with runs in the next two innings, but the Reds inched ahead once again in the bottom half of the fourth when Phillip Ervin homered to left. Two innings later, the good guys broke it open with a really strange sequence of events. With one out, Williams singled and advanced to third when Barnhart singled. Ervin then singled on a gorgeous suicide squeeze bunt, scoring Williams and giving the Reds a 6-4 lead. 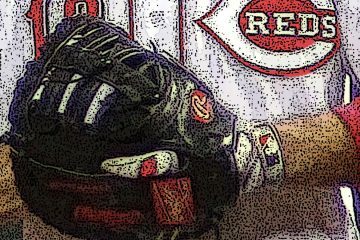 Lorenzen then laid down a bunt that was likely intended as one of Interim Reds Manager Jim Riggleman’s beloved sacrifices, but it got past the pitcher and Lorenzen reached to load the bases. That’s when Schebler homered to right, a grand slam that gave the Reds a 10-4 lead and put this one out of reach. Ervin added a two-run homer in the seventh — his second of the game and sixth of the year — and that was all she wrote. –Matt Harvey will go to the mound tomorrow in game three of the series. Plenty of good tickets still available. After running numerous computer simulations and regression analyses I have rached the conclusion that it is better to have a leadoff hitter with an OPS of .827 versus one with an OPS of .621. Finally, a quant geek providing some context and actual data in the comments section around here. FWIW, I trust what the front office tells us…and they stated there will be an exhaustive search for a full-time manager. Based on your number-crunching, I see no way a modern MLB front office, of which the Reds are 1 of 30, could bring back a manager who doesn’t optimize whenever possible. Logically, therefore, we should not have to worry about Mr. Riggleman filling out a lineup card after the end of this season. But don’t you know, if he is not as fast as billy he clogs up the bases. Why Billy is a fan favorite, and people pay money to watch him strike out. Suarez doesn’t have the range to play SS on a daily basis. If anything, we want him to bulk up and become even more of a protypical power guy. We’d also like Suarez tp play third the way he did in 2017. Somebody would trade for Ervin, but he has a pretty extensive minor league history and this year is a sss, so I don’t think you’d get a good starter for him unless there was a good deal of other talent included with him. Also, the Reds will need to have an outfield next year, and Trammell and Siri are unlikely to be ready. Ervin, Schebler and Winker with, possibly, BH used properly might serve. But DFA williams, we have trammel and siri enroute, and can get a hold me over on FA. Schebler probably brings more in return than Ervin and also is line to be a super2 arb guy. Also Ervin is their only RH hitting OF unless they sign/ trade for one or Jose Siri jumps over AAA next spring. I like a lot of this, especially the idea of replacing Hamilton in CF with Peraza. However, my only concern is whether Suarez could still play SS. Though you could just play Senzel at SS, who I think is likelier to play there in the near future. All of this lets you replace the worst hitter in the lineup – Hamilton – and gives Senzel and Gennett a place to play. Defense could be a problem, but I wouldn’t mind seeing some out-of-the-box thinking from the Reds. So your going to move your best player from a place he has become comfortable for an unproven unknown commidity? How about we leave people where they are and trade Senzel for some actual major league pitching. Senzel is a prospect with health concers. As with Ervin, he’d have to be part of a package to bring the sort of pitching help the Reds need. 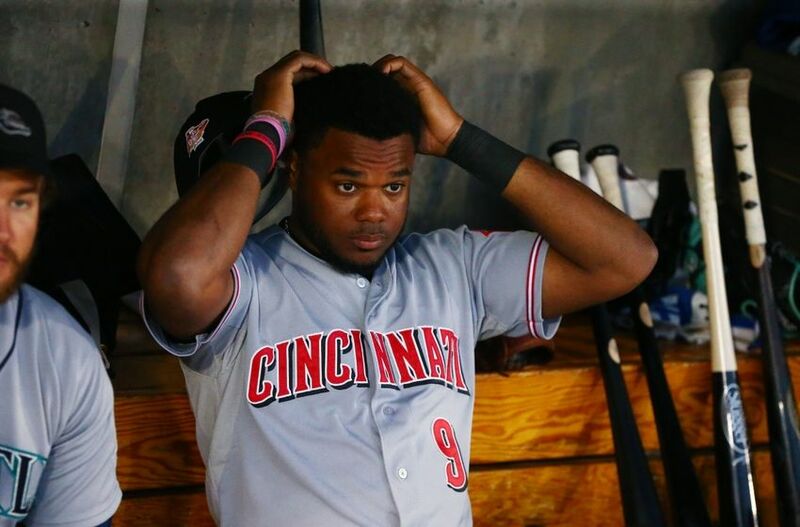 He’s also, leaving aside the health concern, potentially a tremendous asset as a future anchor in the Reds’ lineup. But, yes, they do need pitching help. I think this is pretty much what Riggleman finally got around to saying. He said he didn’t anticipate using Bailey out of the pen. He did however leave the door slightly ajar for Bailey to start (if they have an injury situation). Another area of concern, besides starting pitching and BaileyÃ¢â‚¬â„¢s contract, is the decline on VottoÃ¢â‚¬â„¢s production at a clip of -200 OPS points between 2017-2018. At that rate he wonÃ¢â‚¬â„¢t make it past next season, with his contract still running until 2024. His peripherals are actually very good in contrast to his OPS decline, FWIW. It is the same issue as back in 2013 when Votto’s slugging was off. If the team had projected him for 25-30 HR along with a high level of doubles and he doesn’t produce them then it becomes a team issue to replace them because while walks and singles are better than outs, HRs and doubles are worth even more than singles and walks. In 2013, Votto still slugged almost .500 (.491) and created 5.7 oWAR. In 2018 his slugging has dropped to just better than .400 (.409) and he is going to end up at about 2.5 oWAR (currently 2.3). Whether or not Votto produces enough WAR value to cover his contract cost, there is a real decline in his WAR that the team has to compensate for. Votto doesn’t hit lefties even close to what he could in his prime. His OPS this year against lefties is .685. His skill is drawing walks, but his average exit velocity this year is below MLB average. He turns 35 next year, so the decline should be expected. The league is unrelenting. Other teams, no longer fearing his bat, will slowly begin to throw him more strikes, making the walks harder to come by and placing him more and more in pitcher’s counts. In fact, Votto has generally fared worse this year against the NL Central than the league in general, which would suggest that the teams most familiar with him have already adjusted how they are pitching him. This makes a lot of sense. Votto may be at a point where he needs to have a heart to heart conversation with himself about relenting to sacrificing some OBP for slugging to be a more meaningful contributor to the team. This is particularly true because he no longer can go 1st to 3rd on a single, or consistently score from 1st on a double or 2nd on a single. Thus, it typically takes 3 positive following outcomes to score him from 1st. It might also be a good idea to make sure Winker talks to his equipment provider and has a couple of 1B mitts in his kit for next year. A game a week for him at 1B might work wonders for both he and Votto along with being in the best interest of the team. that would be the worst defensive team in the history of baseball. ThereÃ¢â‚¬â„¢re some players in current roster that shall be cut-loose, non-tendered or traded if possible, as theyÃ¢â‚¬â„¢ve received plenty of opportunities and continue to under perform, namely Hamilton, Bailey and Stephenson, with Finnegan and Reed being very close. Just adding by substracting. The Problem with Homer is the 28 MIl he is owed after this season. Hard for Bob to allow it. Bob’s Uber rich, eat the 28 million. If he can’t he needs to sell the team to owners with money. JimT, I agree 100%. You couldn’t win games with Koufax, Alexander,Grove,Gibson and Bailey. Saw Peraza’s double last night before I went to bed. Watched the bottom of the 6th just this morning. Amazing the things we can do (even “good bunts”) in these situations. What a game. What a result. Last night’s game should have never been played. This holding the fans hostage or loss of tickets is ridiculously absurd. If they can’t start a game within sixty minutes of stated start time then games need to be cancelled and either full refund issue or ability to trade tickets for a future game. This greed by MLB is absurd. Never going to give you your money back. I know one circumstance where they did. A couple years ago I was going to a game with my Dad. Due to rain the start time was delayed. We waited it out about an hour in one of The Banks’ establishments. When another half-hour delay was announced, we decided to give up and go home. They eventually played the game. I wrote to the Reds and said my Dad and I couldn’t wait it out due to the lateness of the hour. They let me exchange the two tickets for another game. Now, I was then a season ticket holder, so that might have made a difference, plus the fact that I didn’t actually use my original one. I agree with the general point that rain delays can be bad for ticket holders. On the other hand, I’m sure there are people who are in town just once a year and prefer to wait out the rain than have the game cancelled. Ideal policy: After an hour delay, you can leave the game and exchange your ticket for a future date. Or you can stay if you want. That idea of one hour and trade option is perfect. I live in Indy and getting home at around 3am isn’t appealing but if I had another ticket I would drive back over. Given that the Reds are must be a regional team to truly prosper, GABP should have been built as a retractable roof stadium similar to Safeco field which is about the same age. Unfortunately the Reds ownership at the time was out maneuvered by the Bengals ownership and left to make do with the leftover crumbs of the public funding which ironically passed because people wanted a new Reds stadium. I am not a Cincinnati or Ohio taxpayer, but the idea of taxpayers’ spending an extra $100 million or more to eliminate a few rain delays makes no sense at all to me. I chose Safeco because it is in “rain country”. It is not an enclosed stadium, it merely has a retractable, i.e. sliding, roof which provides cover to the playing field and seats: thus they don’t have the HVAC costs of an enclosed stadium either at construction or operation. I believe it is more than fair that the leagues (MLB/NFL) and teams should bear the cost of such an amenity as a retractable roof (and even more of the general stadium costs than they have in the past). Keep Schebler he is contract friendly the next few years plus he creams left handed pitching. Ervin is hitting .279/.349/.448 on the season. If nothing else, heÃ¢â‚¬â„¢s put himself in the mix to make this club out of spring training next year. It’s time for Ervin to play everyday and Billy to sit. Or move him. We’ve given Hamilton enough chances. Winker, Ervin, Schebler next year. My guess is that they will keep Gennett another year, deal Hamilton, and promote Senzel in mid-April. That gives them 8 regulars to fill the 7 non-battery positions. As a practical matter, then, Senzel will have to play several positions. They would ideally sit at least one of the lefties (Gennett, Votto, Schebler and Winker) against LH starters, with Senzel and Ervin always playing instead, and Winker playing first when Votto sits. Senzel could also spot-start at third, and maybe a handful of times at short. They need to start working on it with Senzel in the Arizona Fall League, not wait until April 5. Except Senzel was not on the AFL roster released last week raising questions whether and where he will play in the of season. Kudos to Jim W. For sticking by Ervin through thick and thin. Always had a just wait attitude in his comments when Ervin struggled earlier. Even through the missed cut off throws and not so good base running, Jim was always optimistic on Ervin. It kept me even balanced on Ervin and I am glad I didn’t take the exit on Ervin. I would bet that Atlanta would like to have Ervin and not Duvall now. Nothing against Duvall but glad it was he that Atlanta wanted. Ervin is filling Duvall’s shoes very aptly . Not so much with power, but with all around play. For that matter I’m still standing by that RS, barring injury, will eventually be at least a league average starter somewhere within the next couple of year. Did you catch the twitter furor the other day when I said I was as disappointed with Luis Castillo this season as I was with Homer Bailey? Somehow for a lot of folks that apparently came out as a defense of Bailey which it wasn’t. About a week and a half ago somebody posted a link to an article about what Oakland is doing with their pitching staff. Mostly on how de-emphasizing the fastball to about 25%-33% usage and emphasizing other pitches. The off speed pitches set up the fastball, instead of the other way. It was a very interesting article. I believe Stephenson could thrive in that type of system. He has a nasty curve. Maybe he can harness that fastball with much lesser usage. It might be pretty cool if the new manager could hire away Oakland’s pitching coach. They are do I g something very right there. Given the results RS was getting at Louisville, he must have been pitching “back\wards” there unless his arm started bothering him right before he got called up; and rather than man up about it he just switched to the curve first philosophy with the Reds because he couldn’t command his fastball. I went back and looked at his stats during the 2 month run up to when he was called up; and, I couldn’t pin point any specific spot where I something jumped out as maybe being indicative of a change in approach. In his last 7 games at AAA he K’d 55 batters in 44IP. The strange part was that he had 3 double digit K games but also had 3 games of 5 or fewer K’s; and all three of those were in his last 4 games at AAA. But then he K’d 13 in 6 inning in his final AAA appearance. So, if his shoulder was twinging in those 3 low K games, it must not have been in the last game where he rang up 13. I would bet Atlanta would rather have Ervin over Duvall 3 years from now too. At least Ervin starting today, Williams sits, Hamilton in center.